The World Health Organization Commission final report: Closing the Gap in a Generation discusses many social determinants of health, including early childhood development, globalization, health systems, employment conditions, priority public health conditions, measurement and evidence, women and gender equality, urbanization, and social exclusion. However nowhere in the 200-page manual, which addresses health inequalities, was there any mention of sexual orientation. 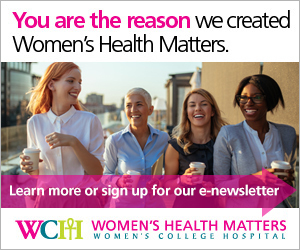 Women’s Health Matters spoke to Dr. Carmen Logie of Women’s College Research Institute, regarding her research proposal, which focuses upon the health-care gap affecting sexual minorities and the need for sexual orientation to be recognized as a social determinant of health. Sexual orientation is a determining factor when receiving the right care from your physician. According to Dr. Logie’s research published in the American Journal of Public Health, there is a communication gap within medical assessments that contributes to health inequities in the lesbian, gay and bi-sexual population (also referred to as sexual minorities). While it is for the individual to decide whether they are comfortable to discuss their sexual orientation, there should always be an open discussion with a physician. An open dialogue during any health assessment ensures equal access to health care for sexual minorities. The everyday stress suffered by any minority may be influenced by cultural, religious and societal norms. In the case of sexual minorities, sociopolitical factors can greatly affect how they identify with themselves. Dr. Logie refers to this as the minority stress model. The oversight of sexual orientation as a social determinant of health reveals evidence that sexual minorities are more vulnerable to developing mental health problems influenced by acts of discrimination. Dr. Logie notes the evidence revealed through studies illustrates several forms of health disproportions. The need to have an open dialogue about sexual orientation should be on every health-care provider’s radar in order to remove negative perceptions internalized by the patient. Dr. Logie notes that not every member of the LGB population has a negative perception of their sense of self, but the health-care providers should still be aware. In Canada, people have the right to openly discuss their sexual orientation given that it is protected under the constitution. However according to research on sexual minority women in the workplace conducted by Dr. Logie, one-third of sexual minority women said that their health care provider did not know their sexual orientation and half of these women did not think it was necessary to disclose. Including sexual orientation as a social determinant of health means that the LGB populations have greater access to resources and support services. Dr. Logie mentions several implications that would contribute to conquering the health-care gap affecting sexual minorities, and it begins with the recognition by the World Health Organization. Currently, homosexuality is criminalized in 76 countries and punishable by death in five. The inclusion of sexual minorities in the Social Determinants of Health final report would enable a public stance and increased ground work to challenge the criminalization of innocent people. Although decriminalization does not put an end to acts of discrimination, it enables global awareness and brings sexual minorities one step closer to equal access to care. This complex issue should not be regarded as one simple category. Dr. Logie suggests that the World Health Organization understand the inner complexities of sexual minorities as a social determinant of health and how it would influence other social factors. By simply integrating sexual orientation into the discussion, new breakthroughs can be made to resolve health care communication gaps. Sexual minorities would be provided with the proper materials and resources, while physicians would be made aware of the possible risk of mental health problems.